I finally got around to driving to Carmichael the other day to check out the new Milagro Centre, which opened last summer. Several different restaurants are housed there, but the one I was there to try was Mesa Mercado. Unlike most Mexican restaurants, Mesa Mercado doesn't provide complimentary chips and salsa when you're seated. Instead, they bring out a refreshing dish of mango bites, sprinkled with chili powder. I thought that was a nice change from chips, which often fill me up before I even receive my entrée. Of course, if you'd like chips, you can order the chips and salsa trio or the chips and guacamole appetizer. 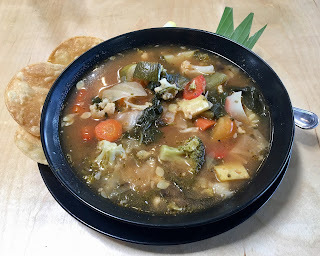 There were a couple of entrées that appeared to be either vegan or veganizable, such as one of the salads and the veggie tacos, but the dish I chose was the caldo de cosecha, a big bowl of hearty vegetable soup. Filled with broccoli, cauliflower, spinach, squash, carrots, peppers, and I don't know what all, and served with crispy mini tortillas, it was a tasty and satisfying meal. 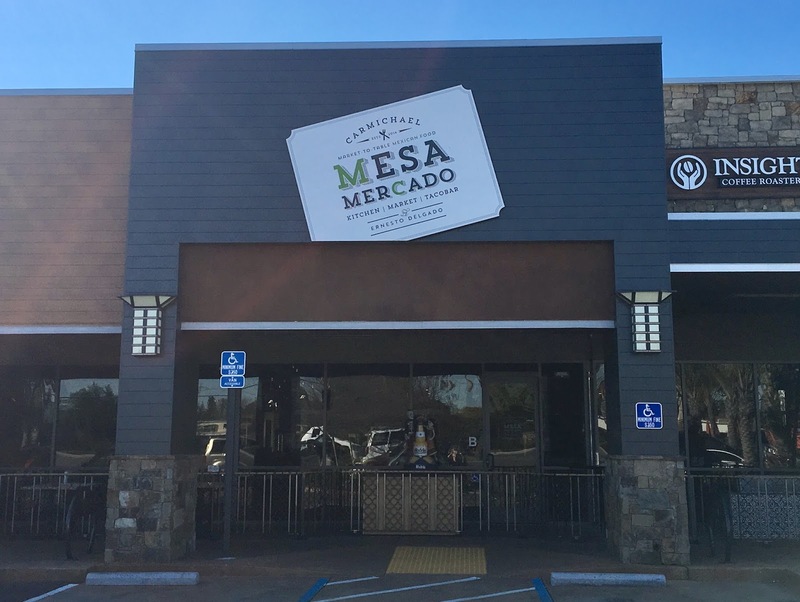 Mesa Mercado is located inside the Milagro Centre at 6241 Fair Oaks Boulevard in Carmichael, and the phone number is 916-283-4081. 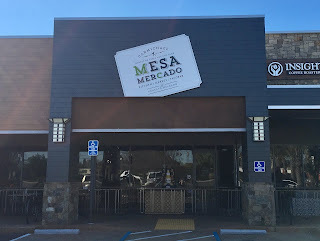 Their website address is http://mesamercado.com/, and their Facebook page can be found at https://www.facebook.com/Mesa-Mercado-1495372880732521/. The restaurant is open Sunday from noon to 8:00 p.m., Monday through Thursday from noon to 9:00 p.m., and Friday and Saturday from noon to 10:00 p.m.
Good to know. This is not far from us. Thanks for your time and the review. You're welcome! Let me know what you think of the restaurant. Thanks for reviewing us! FYI, we have both vegan and vegetarian dishes on our menu. On the print menu at the restaurant, there are little icons that identify them. 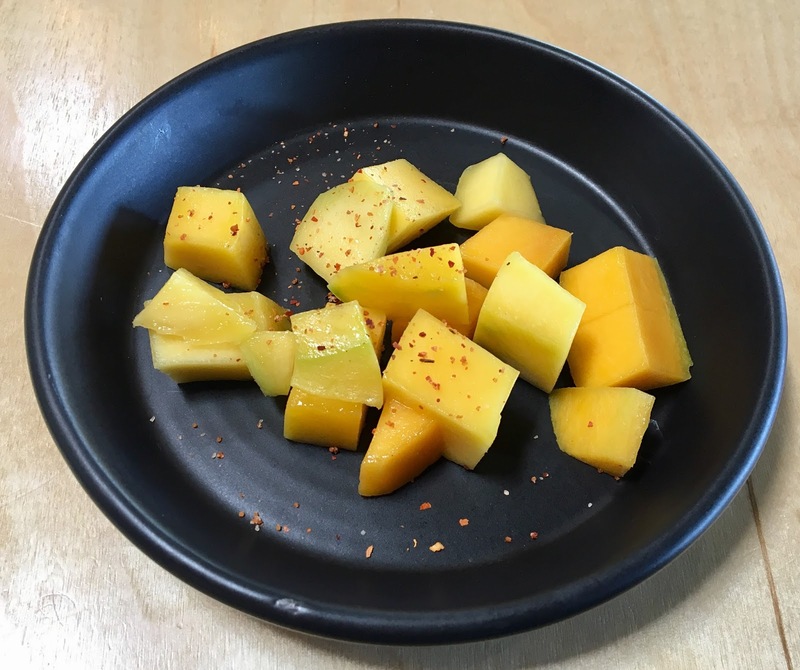 And then on the online menu at our Website—http://mesamercado.com/restaurante/menus/dinner—you can click the "Vegan" or "Vegetarian" tabs to filter only those items. Thanks again!